Highly resinous Indica dominant strain that’s easy to grow. Hash Plant feminized cannabis seeds are a combination of 80% Indica and 20% Sativa genes, which produce this fast-flowering, heavily resinous strain. Originally from the Netherlands, Hash Plant is well-known for its medical applications, with high CBD levels providing relief from headaches, body pain and arthritis. Considered an easy strain to grow, Hash Plant can be cultivated both indoors and outside, producing a dense, bushy plant with multiple budding sites. Totally feminized seeds produce pure female plants, eliminating the need for sexing, while the plants overall yields can be increased with the use of advanced growing techniques, such as the Screen-of-Green method, bending, topping and super-cropping. Flowering times are average for an Indica dominant hybrid, requiring approximately 8 weeks for the buds to fully mature indoors, or early September when cultivated outdoors. Although not the largest producer, with yields of approximately 300 grams per square meter grown indoors, and 150 grams of dried buds per plant when grown outside, Hash Plant produces large quantities of resin, perfect for those wishing to make edibles and concentrates. THC levels of approximately 12% produce a relaxing, therapeutic ‘body-stone’ that helps the user unwind at the end of the day. While an elevated CBD content of 3.5% makes it a perfect choice for medical cannabis users who enjoy its powerful, long-lasting effects. 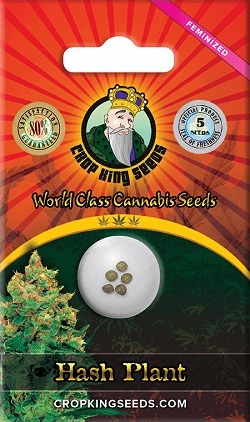 If you’e looking for an easy-growing strain that delivers a narcotic high, Hash Plant cannabis seeds are a great choice. Sold in packets of 5, 10 and 25 feminized seeds, you can enjoy large savings on the bigger sized packets. All of these feminized Hash Plant seeds are distributed by Crop King, Canada’s leading producer and distributor of the highest quality cannabis seeds. With a variety of payment and delivery options, as well as a first-class customer care team, enjoy total support from purchase through to harvest. Click below to learn more and buy Hash Plant cannabis seeds. Buy Hash Plant Feminized Seeds today and receive fast discreet shipping to Canada and all US states.